I covered this in episode 48 of my podcast but in case you are like Hallen Turrek and don't listen to anyone else, here it is in a nutshell. Now CCP could generate ISK directly from a PLEX out of nothing, but since ISK is used for everything in game that could quickly destabilize the economy and game if that generated ISK does not go to micro transaction vanity items. In order to ensure that the consumed PLEX goes to vanity items in microtransactions, they generate Aurum instead of ISK. This has the added benefit of controlling the real life price of the microtransaction items (i.e. it is not determined by player supply and demand). In other words, forgetting that in EVE as a virtual world anything economy is derived of human behaviour merely partially embedded in game design, they just want to play with making it look as if it is so awesome that it requires its own equivalent of economic instrumentation - forgetting even the warnings of that in recent times in life itself. Yeah. Truth be told, in its own right, it is far more unsettling that they take these approaches than the certainty that it is not going to end with vanity items. A check this morning shows sell prices for PLEX in Jita starting at 390m - up about 5-10m from last Sunday. A look at the PLEX price history shows it's on something of a rocket ride that starts back at the beginning of May. Looks like a speculative PLEX market atm, with in-game PLEX brokers expecting a big uptick in PLEX demand after Incarna goes live. I can't imagine a situation in which I will be participating in such foolishness. The only scary part is when (and hopefully never) this type of transaction moves from vanity to something that actually impacts game play. 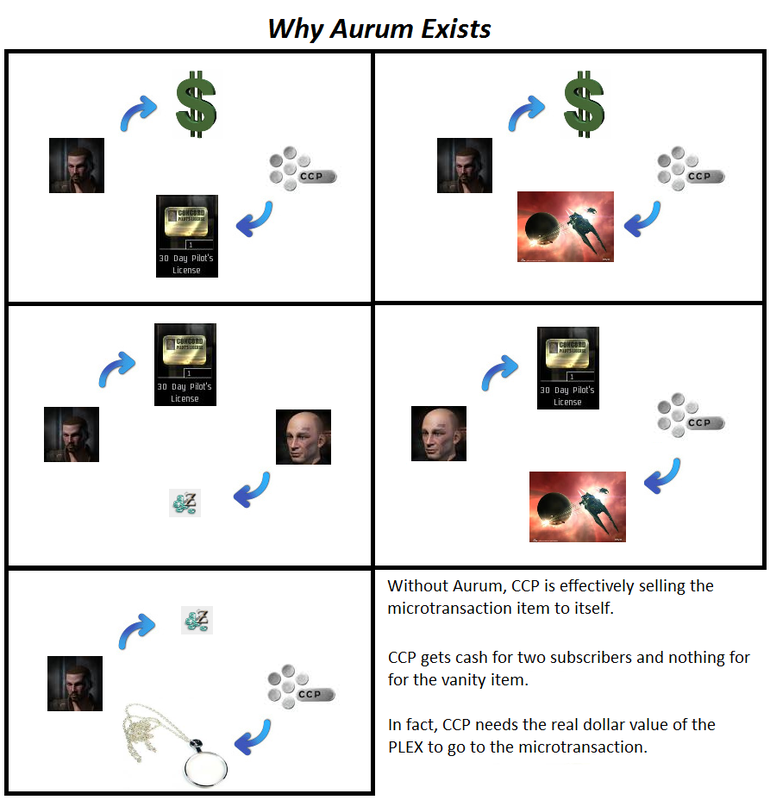 The introduction of PLEX already favored the out-of-game rich, if such a transformation of Aurum happens the game may be dominated by those that can afford to dominate it. And the gap between the have and have nots will only increase. I think there is more to it than just simple vanity items. Back when Dust514 was announced they noted that items in Dust would be of a different currency than EVE (don't remember which post and cba to find it). - I may be wrong *shrugs* it's the interwebz - They also said it would be of less value than ISK. Making us the Gods of the skies. 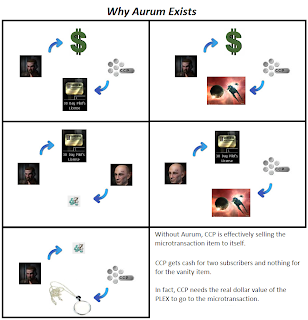 With the recent development of Aurum and the coincidental announcement of a the Dust514 'free-to-play' system, it's not much of a leap to place Aurum into the Microtransaction model of Dust514. This is purely speculative but it seems to make sense to my addled brain. Perhaps one could trade Aurum into a third system of currency to be used by Dust players. But once that chance is made it can't be reversed,and the exchange rate is high enough to make a small amount of Aurum turn into a large amount of Dustbucks(heh.